While Down pillows are comfortable and conforming, they constantly need to be fluffed and do not hold their shape throughout the night. They are also a problem for those that suffer from feather allergies. Good quality shredded memory foam solves this problem through its ability to conform, but can make too heavy of a pillow for some users. Only the Snuggle-pedic (tm) uses a proprietary mix of our very special hypo-allergenic and extremely low V.O.C. Biogreen® memory foam and CertiPur-U.S. certified foam. This proprietary mix of foams come directly from our very high-end, all U.S.A. produced mattresses made right in our Westlake Village, CA factory. 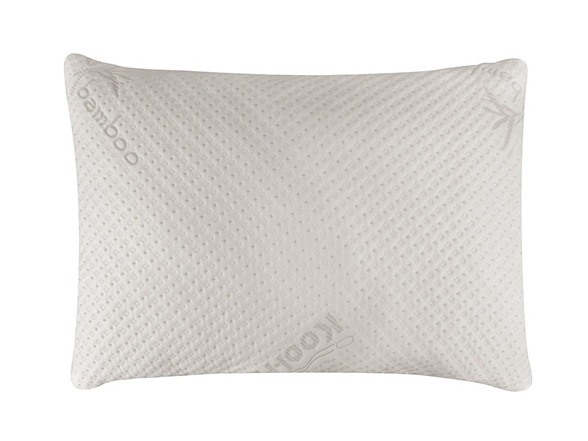 The very small pieces are extremely soft and fluffy and make our pillow lighter and more resilient than the usual shredded memory foam pillows found on the market. Shredded Style Combination Memory Foam Pillow That NEVER GOES FLAT! KEEPS YOU COOL ALL NIGHT LONG! Now With Zipper Removable Outer Cover To Allow For Easy Adjustment of Thickness and Comfort. Conforming Shape Orthopedically Supports the Neck For Side, Stomach, & Back Sleepers. Hypoallergenic & Dust Mite Resistant. Rolled & Vacuum Sealed For Eco-Friendly Shipping.